Just over a decade ago, one of the first major dominoes in the mortgage crisis toppled. The venerable Wall Street brokerage firm Bear Stearns collapsed, forcing the government and Federal Reserve to arrange an emergency bailout and shotgun wedding with JPMorgan Chase (JPM, Rated “B+”). Many on Wall Street and in Washington were shocked. I wasn’t at all. Indeed, I had been warning about a massive housing and mortgage collapse for the better part of three years before Bear went under in 2008. Heck, Bear wasn’t even the first mortgage-exposed company to implode. A little-known firm called Ownit Mortgage Services was the canary in the coalmine when it went broke in December 2006. It was followed by the much-larger New Century Financial in April 2007. Of course, Bear wasn’t the last to topple, either. Fannie Mae, Lehman Brothers, Washington Mutual, and AIG either all went broke or needed massive taxpayer-funded bailouts down the road. That’s history. But what’s frustrating to me NOW is that many pundits are asking the wrong question on this crucial anniversary. They’re asking: “Could Bear Stearns happen again?” And many are answering in the negative. They’re citing new regulations enacted after the financial crisis, increased capital levels in the banking system, and tighter mortgage lending standards, among other things. The root cause is debt, as I started to explain last week. Too-many interest rate cuts ... and too-much money printing ... going on for far too long ... flooded the global economy and capital markets with the biggest tsunami of easy money in world history. 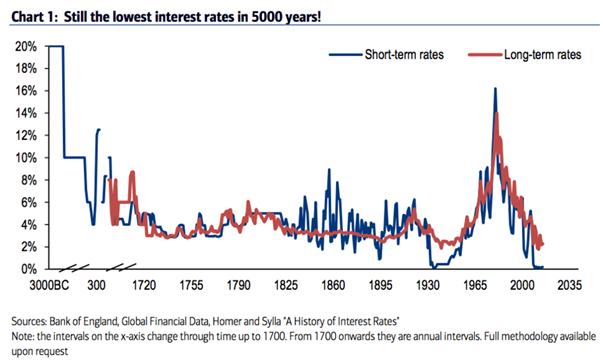 In fact, one team of highly respected analysts wryly noted that global interest rates were driven down to their lowest levels in more than 5,000 years of recorded history! We literally have never seen anything like it going back to the Bronze Age, as you can see in this chart. And this time around, all that easy money didn’t stay “well-contained”, to use the infamous vernacular that former Treasury Secretary Hank Paulson and former Federal Reserve Chairman Ben Bernanke used to describe the mortgage crisis. We’re seeing it influence everything. Martin and I gave you some examples the other day. Bonds of all types. Stocks of all shapes and sizes. Trophy homes, artwork, and even collectibles. But here’s yet another one. 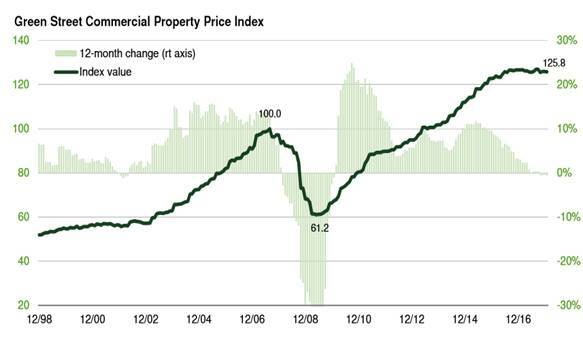 This chart shows what has happened to the price of COMMERCIAL real estate over the last several years. 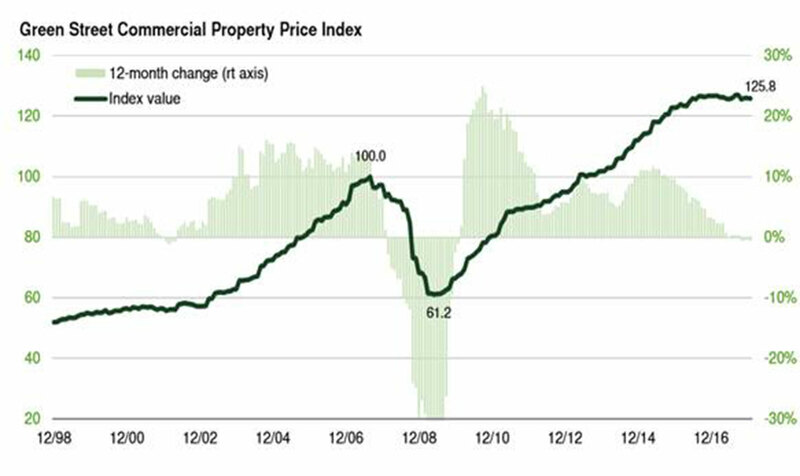 You can see that the Green Street Commercial Property Price Index has more than doubled to 125.8 from its Great Recession low of 61.2. Not only that. It’s now more than 25% higher than it was at the 2007 peak — during what was considered (at the time) to be the biggest real estate bubble in U.S. history! Does that worry you? Because it sure worries me! What’s even more concerning is that now, the global flood of liquidity is starting to ebb, interest rates on all kinds of debt are starting to go up, and investors are starting to nervously eye the exits. So, I’m responding by taking increasingly aggressive protective action in the services I manage, and my own financial life, to get ready for what’s coming next. I believe you should do the same. One way you can start is by using our Weiss Ratings to get rid of any garbage that’s weighing down your portfolio. Right on our home page, you’ll see graphics that show how many BUYs, HOLDs, and SELLs our Ratings system is doling out at any given time. Thousands of stocks, ETFs, and mutual funds are in the SELL category. Some of them might have been carried higher by the tsunami of liquidity created over the past several years, despite their lousy fundamentals. But do you really want to trust them anymore now that the environment is changing? I recommend you use our Ratings to do a “portfolio detox,” eliminating SELL-rated investments that could hurt you in the months ahead. Because ... again ... the question isn’t whether one company out there might be the “next Bear Stearns.” It’s whether because of the “Everything Bubble,” you might be exposed to Bear Stearns-like toxic assets all around you!